Landscaping seeks to integrate structures to the world around them: in doing so, the design should complement and accent the features of the structure while relating to the surrounding environment. I could retire if I had a dollar for every time I’ve approached a client’s home on a walkway that is 3 feet from the front foundation. To properly “ground” a structure to the environment, the walkway needs to be at least ten to twelve feet away from a structure- more is better. I refer to this distance as the “horizontal plane”: the distance required to provide adequate space for at least three distinctly different layers of plant material. These layers of plantings will work together to soften and integrate the structure to the landscape; this interaction of layers is not static but moves in and out, up and down. I remember a project where the husband was completely against the concept of removing a “perfectly good” twenty-year old, three-foot wide concrete walkway that was four feet off the foundation. After driving the clients around and showing both of them several of the projects we had installed, the husband was converted. Luckily, the husband loved the plants and once he saw what proper plant selection and placement could do, he actually insisted that he was going to take the first swing with the sledge hammer when we removed his concrete walkway! One of my favorite landscaping stories is about a magnificent home in Englewood Cliffs, NJ. The home was designed by famous architect associates and had magnificent detail. However, it was a beautiful home that had been over landscaped. My firm was contracted to perform landscaping work in the rear yard; as time progressed the client asked us to perform pruning and various other maintenance services for the entire property. The long and short of the story is that I stood staring at the front of the home (which had been landscaped several years earlier) and realized that some of the beautiful, expensive plant material in front of this home had to go. The house was gone, hidden behind an urban jungle of expensive, valuable plant material that had no business being where it was. It took me a few months, but on a sunny Saturday morning my prescription was filled as we pruned two beautiful hornbeams flush with the ground. Two cuts, that’s all it took, and the beautiful columns and brick detail suddenly reappeared. The house was back! We finished pruning the remaining plants and the home was magnificent again. I believe that there is an epidemic in the landscape world: most plants are planted in the wrong place for the wrong reason. The most common mistake is the issue of the height at planting vs. the height at maturity, and the inappropriate selection based on available space, proportion and suitability in relationship to the architectural detail of the structure. Interest and beauty in the landscape can be achieved in several ways including color, texture, and the layering a succession of blooms over the course of a season. Landscaping is not a token row of bushes in front of your home or patio. Landscaping is a collection of several plant varieties that work together to provide an outdoor orchestra of changing scenes week after week through the year. Plant material should be selected with all the seasons in mind. In fact, the most common plant material used in the northeast (azaleas, mountain laurel, and rhododendrons) bloom so early that most people are not even out of the house yet enjoying their gardens, patios and yards. There are many varieties of plants that bloom through the summer months that should be incorporated into the garden layers that will provide visual and aromatic interest. Plants are nature’s gift to us: proper use will pull you out of your home and away from the PC or TV. Ornamental grasses and several flowering plants provide movement and even sound when the wind blows; flowers provide visual stimulation and wonderful fragrance. The successful integration of these four layers provides for the most balanced and “natural” feeling landscapes that are also the most beautiful. Close your eyes for a minute and picture the brand new sub-division of beautiful new homes, perhaps on recently developed farm land. It does not and will not look right because the canopy layer is missing, there are no trees, the shrubs are tiny, and the layers do not exist yet. Harmony is achieved when all these layers exist in balance with each other. Insufficient trees make the landscape feel stark and naked; conversely, with too many trees, the other three layers struggle to exist. See number 4 above. I can’t tell you how many times over the years I have the same conversation with a property owner. The funny thing is how many landscapers before me get fired because they don’t tell the customer the truth: “You can’t have grass here.” There are two choices: 1) prune or remove the tree, 2) plant the appropriate plant material under the tree and create a beautiful shade garden consisting of groundcovers, hostas, ferns, astilbes and literally hundreds of other magnificent shade-loving plants. Create winding pathways with a few boulders or a bench, but whatever you do, give up on growing grass in heavy shade. If you cannot get grass to grow and sunlight is not the issue, there is no reason that cannot be overcome to establish healthy turf. Turf needs healthy soil, sunlight and water. Any deficiency other than sunlight can be addressed by a trained professional. A properly designed and implemented landscape will reduce the incidence of weeds. A garden is a living environment consisting of the layers we have spoken about above. As it matures, mulch disappears and the herbaceous layers knit together. Weeds don’t have a chance in the maturing landscape. Landscaping is not a mulch bed in front of a house with some shrubberies placed about. This sea of mulch without a doubt will be a haven for weeds to sprout. Plant only the amount of beds that you can properly care for. A properly planned and planted landscape will fill in and cover the entire planting area, reducing the likelihood of weed germination. 3” of mulch will provide coverage and act as a barrier preventing weed seeds from contacting the soil. Be careful when selecting your mulch: some mulches can facilitate weed growth as well as soil can. Do not overwater your plants! Too much water is BAD for your plants and will encourage excessive weed growth. Two applications of pre-emergent weed control (such as Preen) applied in the spring will significantly reduce growth. Follow directions on product. Post-emergent (Roundup) spray is easy to apply and kills the weeds. Be careful to apply product to the weeds only as directed by the product label. Some weeds must be pulled by hand because of their proximity to established plants. New landscapes are prone to a higher incidence of weed growth because the soil has been disturbed and aerated. Also, there are more spaces where sunlight can reach the open areas. Water requirements during the first year of a new garden will also facilitate weed growth as mentioned earlier. The good news is that as the landscape matures the incidence of weeds will decrease. Too much of a good thing can be a bad thing and when we are discussing mulch the same is true. Mulch looks beautiful, reduces evaporation (allows you to water less frequently), reduces weeds, and stabilizes the soil. Unfortunately a short drive or walk will reveal the most common mulch mistake: the Urban Mulch Volcano. The Urban Mulch Volcano occurs when mulch is installed year after year to your plant beds and tree rings. Mulch breaks down in time, but most homeowners install additional mulch before removing the faded mulch. This repetitive application builds up and actually suffocates the fibrous root system of trees and shrubs, which in time will put the plant in distress. This practice also makes the plant more susceptible to disease, fungus, and insect attack. The most important practice when mulching is ‘un-mulching’ or in more professional terms “mulch redistribution.” Mulch re-distribution is the practice of evaluating the site prior to mulching. Mulch is removed from tree rings, the leading edge of planting beds and around shrubs as required. The mulch is then redistributed to the areas of the landscape where it is needed, but used where it will be less prominent (under evergreens or behind plantings). Most properties are not irrigated properly. Irrigation systems are a vital component in the health and maintenance of your landscape. The problem is the “set it and forget it” mentality that occurs with most systems. Most properties with irrigation systems are OVERWATERED! The best thing you can do for your landscape is to teach it to grow downward (follow the water). The concept is quite simple and in fact the analogy might resemble a typical teenager. Give a teenager money every day: he will probably become lazy and may not even look for a job. Your lawn is quite similar: give your lawn water every day or every other day and it, too, will become lazy and will not look for water. Conversely, if you increase the watering interval, the plant’s root system will follow the water into the soil and grow deep roots. The best practice is to keep your system on manual and water only when your plants need the water. This is not always practical due to travel and a hectic lifestyle. Second best is having the system on automatic (with rain sensor) and the implementation of a program to reduce the watering frequency over time. We recommend having the irrigation controller mounted on the outside of your home so the landscape professional can make the seasonal changes for you (we offer this service). Irrigation controllers are now appearing on the market with built in weather stations as well as internet access for remote irrigation management. I am very excited about these developments and believe that this facet of the market will be growing and product availability increasing. Water is a valuable resource and proper irrigation management makes sense for many reasons. In order for plants and turf to grow, the soil horizon needs to be healthy. In fact, the soil needs to be alive. By alive I mean that microorganisms, bacteria, and nematodes need to be present. For them to be present the soil needs to have organic matter, permeability and oxygen. The root zone and the microorganisms form a symbiotic relationship so each can co-exist and thrive. When establishing plant beds, soil conditions should be analyzed (soil test) and supplemented as needed to suit the plants that are going to be installed. Most important is the PH of the soil, which should be between 4.5-6.5. Plant beds should be rototilled. Organic matter as well as micro nutrients with beneficial bacteria should be added over the tilled soil and tilled again into the soil horizon as indicated by the soil test. Planting bed preparation is an extremely important step in establishing a healthy landscape. This process goes way beyond digging a big hole for a particular plant. The soil horizon needs to be addressed and prepared properly for a garden to thrive. The land immediately around your structure should slope at least 2% away from your house. From there, provisions (drainage basins, swales or French drains) should direct the water to an appropriate location or seepage pit. It may seem obvious that wet basements are often caused by the simple fact that the ground slopes towards the structure. I often see homes that are built too low in the ground and achieving positive pitch is hindered because the siding of the home is too low. This condition presents significant problems and should be handled promptly. Ideally, planting beds should be a minimum of 6”-10” higher than the pathway or lawn areas so that they subtly stand out. 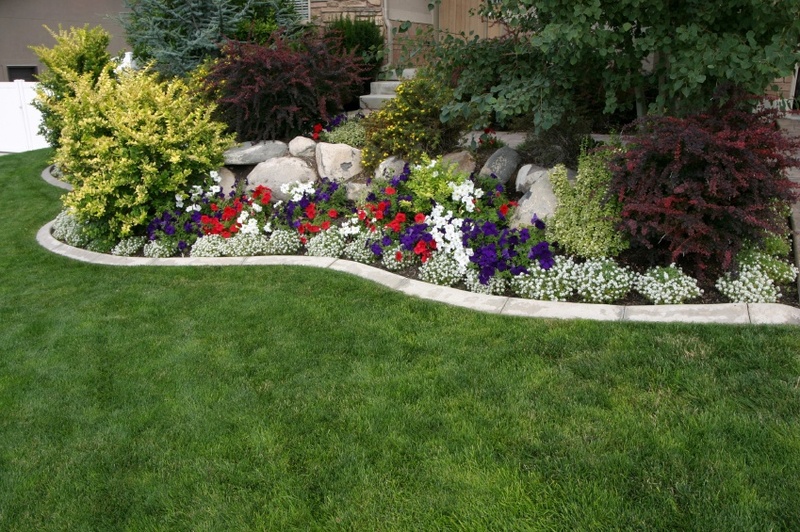 The plant bed should gently slope toward the turf or walkway. 11. YOU THINK EXPERIENCE DOESN’T MATTER? The old saying, “You get what you pay for” is also true in the landscaping world. Unfortunately for the consumer, there is no “Professional Practice Licensure,” but there are several fantastic and talented landscape contractors in the business. The problem lies in the fact that there are exponentially more unqualified individuals operating out of professional-looking trucks that wreak havoc on the urban landscape. Failure to perform soil tests and amend soil accordingly. Planting trees/shrubs without removing nylon burlap or twine which will kill the plant several years later. Planting the wrong plants in the wrong place. The failure to perform a “Root Collar Excavation” when planting trees and shrubs. Failure to ensure there are not “girdiling” or “Potbound” roots when planting container stock. Hardscape installations (walls, patios, driveways etc.) fail due to insufficient base and or compaction. In short, the consumer is often fooled into thinking that they are dealing with a professional when in fact they are not. 12. YOU’RE CHEAPER? YOU’RE HIRED! Selecting a contractor on price alone is probably the biggest mistake consumers make. Once we have done our “due diligence” and make sure that we are dealing with professional and highly skilled companies, we must make sure that we are making our buying decisions on the specifications. In fact, I have often seen and evaluated quotes where the “low bid” was actually the “high bid” once an experienced estimator breaks the project down to the specifications on a [per plant/per square foot/per cubic yard] basis. Frequently the lower price does not include many of the essential elements or it does not include the same amounts. When this happens it all too often occurs that the ‘low’ price is in reality the higher price. Beyond the issue of quantity and quality, another issue to consider is the fact that landscapes that are improperly implemented or plants that are not properly installed will cost thousands of dollars to repair or replace in the future. I would never sign a contract that is a lump sum; however, a particular task in an overall project can be lump sum. As a client, you need to be able to reconcile what was proposed with what was built so that you have the tools to effectively and accurately evaluate your final product.